Happy Easter Sunday...no matter which way to look at it! ;-) I hope you are having a fabulous day! As for the reminder, if you haven't already entered...WHAT ARE YOU WAITING FOR?!?!? The contest ends Tuesday at 9 p.m. Eastern. 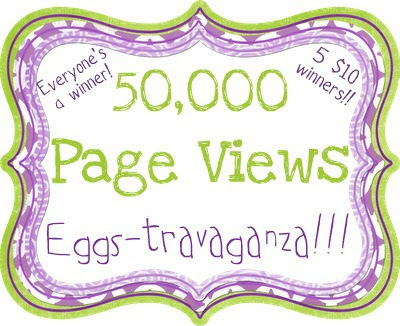 Click on either image above to see the original blog post and enter NOW!!! 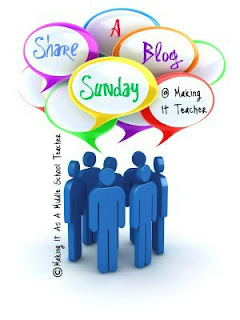 Whew...OK, got that out of my system, so let's get back to business with this week's edition of Share-A-Blog Sunday. Deservingly standing in the spotlight this week is Addie Williams from Addie Education - Teacher Talk! Addie is a new blogger, but her blog has already received the 2012 Education World Community Best Blog Award. Way to go, Addie!! "I focus on ideas and items that have appeal for Middle - HIgh school and try to provide easy classroom tips and tricks that can be implemented easily into a teacher's day. I'm a new blogger and was thrilled to be chosen as one of Education World's Top 25 Blogs for Educators!" A 12-year teaching veteran, Addie has taught English Language Arts, Science, and Social Studies to grades 8 through 12. "I love nothing more than when students who have graduated come to visit or send an e-mail to let me know what they doing and to share in their successes. It's nice to know that I've had enough of an impact on their lives that they'd like to let me know how they're doing." That must be a wonderful feeling! I think some days we all have to remind ourselves about that impact and trudge through the difficulties at hand...or at least I do! Those difficulties become a distant memory when we see the rewards further down the road. By now, you know I always ask my Spotlight blogger to share a few things about themselves, outside of school...because there are real people behind the blog posts we read. "1. I love to be outdoors hiking, mountain biking, snowshoeing, snowboarding or kayaking! 2. My husband and I just purchased a 1960s Muscle Car and we're having a ton of fun in the new world of Classic Cars. 3. I worked in the 'real world" for 5 years after my degree before I decided to be a teacher. I literally climbed a mountain, had an epiphany that I needed to teach, and signed up for my teaching degree the very next day! The rest is history!" What a great story #3 is! My favorite thing on Addie's blog right now is her Earth Day Alien Visitor Activity, which also happens to be free! If I was still in school, I would love to do this assignment. If you haven't already checked out Addie's blog, head on over and do so now. I'm sure you'll want to follow her, too! Thanks so much Michelle... you're so sweet to spotlight other bloggers this way. Perhaps I'll have to teach you to snowboard one of these days! You're welcome, Addie! I really enjoy writing these posts. I follow your blog Michelle :) and shared it on FB!